Tarmac is a British building materials company headquartered in Solihull, Birmingham and is the UK’s leading sustainable building materials and construction solutions business. The company wanted a way of communicating with its staff about important company policies and to ensure staff are updated on a regular basis on new health and safety regulations. It was important to the company to communicate with their employees in an engaging and informative way and without difficulty. Digital Messaging provided a digital signage solution for staff areas based around the Samsung Smart Signage Platform (SSSP) to ensure that the company is meeting its objective of delivering consistent, timely health and safety messages to employees. 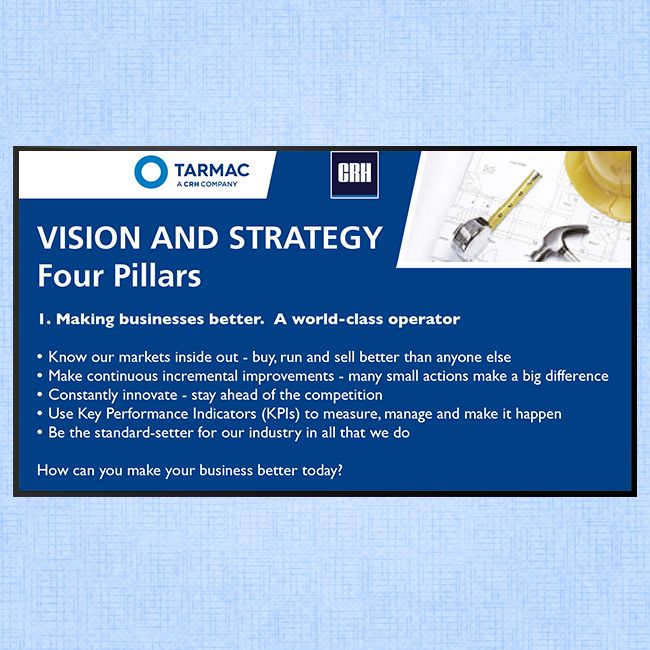 The Digital Messaging Company also provided a content management service, creating an on brand template which allowed Tarmac to display informative messages to their staff. The messages on the screens are updated frequently to ensure that employees have the latest information. 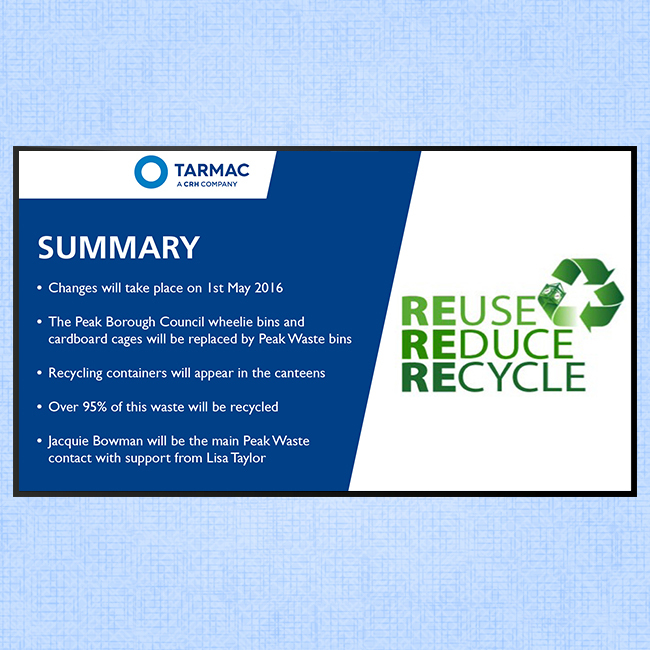 Digital Messaging has helped Tarmac deliver a consistent safety message to all employees via digital signage boards. The process of updating the digital signage is easy, safety briefs are sent to Digital Messaging Company via e-mail, digital messaging make the briefings visually attractive and automatically update the messaging boards via the internet. 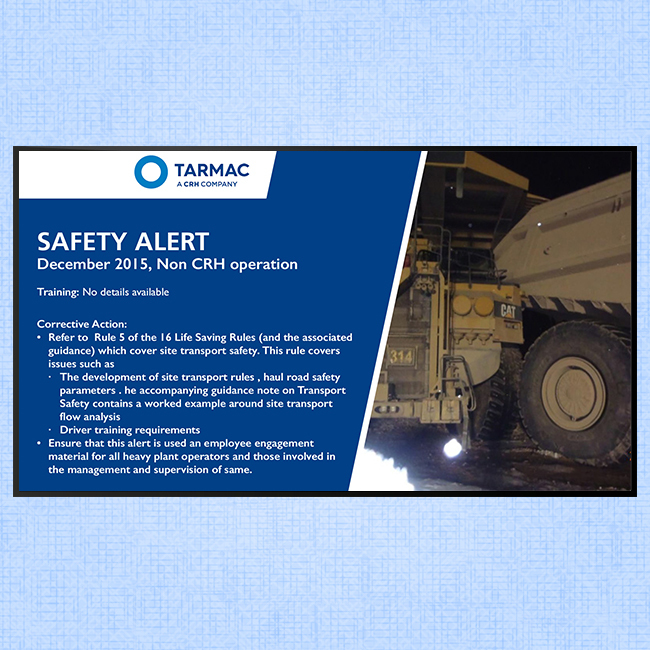 Digital signage has become a key and important communications tool to Tarmac, ensuring that safety information is efficiently and engagingly relayed to their employees. The fact that the digital messaging system is so easy to implement ensures that employee communications are always up to date.